At this moment, I’m outside on my back porch, I’ve got some scraps of lumber, cut end pieces from a house in I am repairing. The fire is crackling, it’s not too cold to be warmed today. My wife and I just returned from seeing Lincoln. I must say there were a few parts of the movie that made me wish I had studied history more and knew it better. Lots of little details in this movie. 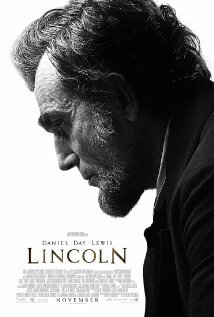 Lincoln is unquestionably the most moving and fantastic movie about historical events that I have ever seen. I can tell you without hesitation that Sally Field (plays Mary Todd Lincoln) will be receiving every award assignable for her part in this movie. She nearly ran away with it from her first scene. Daniel Day Lewis did complete justice to the unassailable character of Abraham Lincoln an will without a doubt be decorated as well. Every actor in the film pulls off their parts to perfection. It is as if you are there with Lincoln rooting for the end of slavery, pulling for the 13th amendment. I felt complete immersion in the story. What a horrible scourge on our country to have ever given into the evil of slavery. It’s a savage, evil an unethical practice. I was in part angered then saddened as to today’s state of affairs where Lincoln’s role, a Republican congress & house is minimized. How curious it is that Lincoln was a republican, he had full republican support and had to fight bribe and threaten the Democrats at every turn to clean this filth from our country’s future. History’s greatest Republican gave the full measure of himself. How did we get from there to where we are today? Lincoln is a stunning experience. Those that love freedom and the fundamental ideals that gave us freedom will struggle as I did to keep a dry eye. Highly recommended, although it would be nice if more than the choir went to see it. Some ideals are worth struggling for, worth fighting for as we still do and I trust you do as well. Let freedom ring! News In History Blog Site with: newspaper reports from the era. This entry was posted in Blog Entries, Moving Material, Philosophy and tagged 13th, Amendment, assassination, Civil, Daniel, day, democrat, douglass, emancipation, Field, frederick, Freedom, Grant, imdb, lewis, Lincoln, movie, north, President, proclamation, republican, Sally, Slavery, south, war. Bookmark the permalink.